Here we report the development of a system that incorporates a pumpless oxygenator circuit connected to the fetus of a lamb via an umbilical cord interface that is maintained within a closed ‘amniotic fluid’ circuit that closely reproduces the environment of the womb. We show that fetal lambs that are developmentally equivalent to the extreme premature human infant can be physiologically supported in this extra-uterine device for up to 4 weeks. 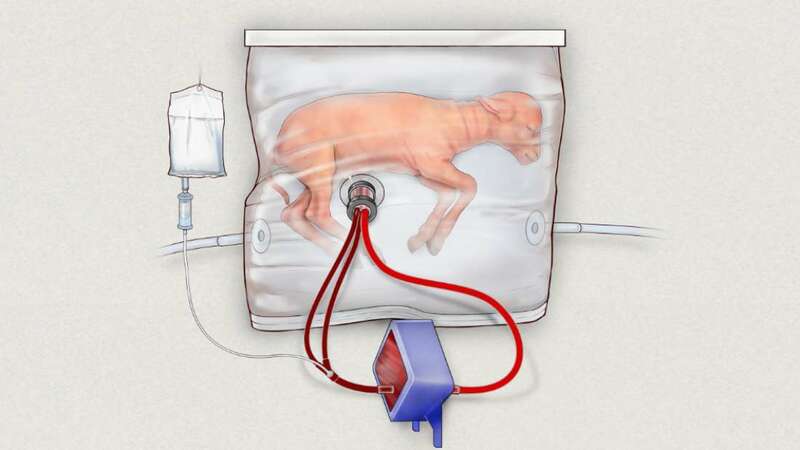 In an amazing advance in medical science, researchers have developed an artificial womb that is able to grow preterm lambs for up to a month. The researchers, from the Center for Fetal Diagnosis and Treatment at the Children’s Hospital of Philadelphia, have in effect created an artificial womb far more developed than anything produced previously. After going through several iterations of the system (including glass incubators) over a period of three years, they eventually settled on one that utilizes a plastic film bag connected to gas exchange machines and sensors. The system effectively mimics the conditions within the womb, with the container being filled with a unique lab-produced liquid that replicates amniotic fluid. As the developing lungs are unable to breathe atmospheric oxygen, this step allows the developing fetus to breathe the artificial amniotic fluid that flows in and out of the bag. It also contains all the necessary nutrients and growth factors for healthy development. Advances in medicine in recent years have seen an incredible increase in the survival rate of preterm babies, with infants born at just 23 weeks of gestation given a 30 to 50 percent chance of survival. But there is a difficult pay-off, as such infants often face a reduced quality of life. They have a staggering 90 percent chance of mortality, while half of all cases of cerebral palsy are due to prematurity. In the latest study, the researchers tested the new system on preterm lambs, which were the equivalent to a 23-24 week gestation human infant. Placed in the fluid film bag, the umbilical cords were then attached to an external oxygenator that mimicked a mother’s placenta. This allowed the fetus’ own heart to pump the blood around the body and out of the womb, without the need of an external pump – the pressure of which can overload underdeveloped hearts with fatal consequences. The lamb was sealed in the bag, isolated in the sterile environment, and protected from changes in pressure and light for an impressive 28 days, during which time they remained healthy and developed naturally, breathing normally, opening eyes, moving, and even growing wool. The researchers are now working on adapting the system, including downsizing it for human infants who are typically around a third of the size of the lambs. It's hoped that this research will set a precedent for how preterm babies are treated and cared for.